Join us on Friday, July 28 at Hula’s Bar & Lei Stand for the official Kick-Off party for this year’s festival. Click here to get your tickets! 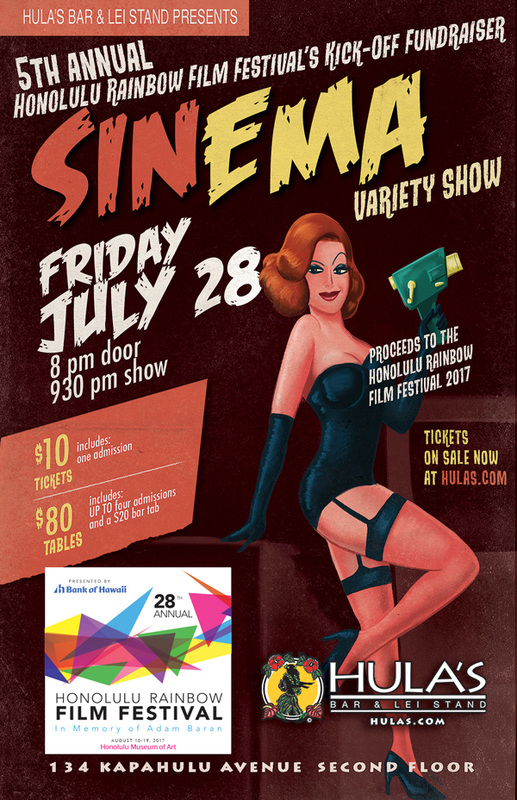 The 5th Annual Honolulu Rainbow Film Festival Kick-Off Fundraiser SINEMA Variety Show. Proceeds go to the Honolulu Rainbow Film Festival 2017. $10 General Admission Ticket includes One Admission plus Your Donation to The Honolulu Rainbow Film Festival. $80 Table includes up to FOUR Admissions for the Show, $20 Bar Tab, Best Seats in the House, plus Your Donation to The Honolulu Rainbow Film Festival 2017!